How investors should think about Caterpillar's stock next year. Caterpillar's (NYSE:CAT) presentation at the annual Credit Suisse Industrials Conference revealed a lot about the company's prospects in 2019. 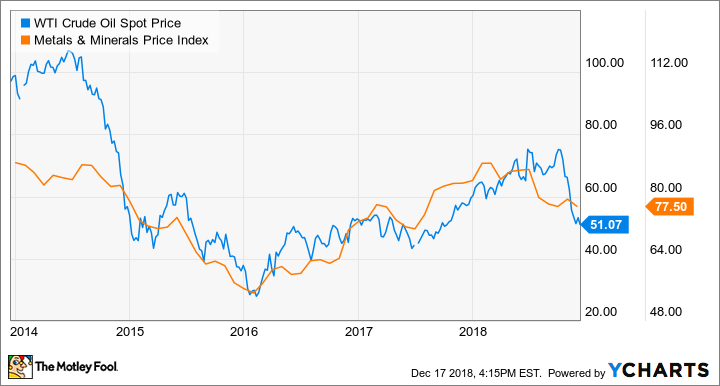 Let's take a look at what was said and how it matches up with what competitors like Deere (NYSE:DE) and Cummins (NYSE:CMI) have been saying. The stock's been beaten up in the last year -- down nearly 15% compared to a decline in the S&P 500 of just 4.3% as I write. Does Caterpillar's outlook mean the stock is a buy? From an execution perspective, prospects look good. Director of Investor Relations Amy Campbell spoke at the conference and outlined management's belief that Caterpillar's mining revenue would grow next year and come with margin expansion to boot. In a sense, she reiterated Caterpillar's position that mining capital spending is still in a cycle of "slower but longer growth." This means Caterpillar should be able to generate incremental profit growth from its resource industries segment. As you can see by looking at equipment segment profit in the third quarter, the resource industries segment is the lowest profit generator, but the increase in profit was far larger than the construction industries segment. Data source: Caterpillar presentations. YOY = year over year. Furthermore, Campbell sought to highlight the construction industries and energy & transportation segments' exposure to infrastructural spending: "We're just starting to see infrastructure spend increase, after many, many years of it continuing to decline." Meanwhile, she pointed out that Caterpillar's exposure to the North American residential construction market (the U.S. housing market is expected to slow in 2019) was relatively small. Her positive view is backed by Deere's 2019 outlook for its construction & forestry segment net sales to grow 15% in 2019, with growth excluding the Wirtgen acquisition forecast to be 10%. Turning to the tricky issue of the impact of a potential slowdown in China on Caterpillar, she appeared to echo the comments made by CEO Jim Umpleby on Caterpillar's third-quarter earnings call when he said that China only represents 5% to 10% of the company's sales. Putting all of this together, it's clear that Caterpillar's management feels positive about 2019. And let's recall that Caterpillar is a company with an acquired reputation for being conservative with guidance -- just cast your mind back to the same conference in 2016, when management talked down expectations for $3.25 in adjusted profit per share (PPS) in 2017 only to report a whopping $6.88 in adjusted PPS in 2017. Similarly, management started 2018 expecting adjusted PPS in the range of $8.25 to $9.25 for 2018 only to raise the forecast to $11 to $12 by the third quarter. Does it all add up to make Caterpillar a buy? Unfortunately, it's not as easy as that, and some of management's commentary seems overly optimisitc. For example, it's one thing to look at Caterpillar's direct exposure to China, but the company's indirect exposure is far larger. The fear is that a protracted trade dispute between the U.S. and China will lead to a slowdown in growth. Given China's pivotal importance to energy and mining commodity demand, this could lead to weakness in oil and mining commodity prices. Indeed, as you can see below, the recent decline in prices has been dramatic. The reality is that when commodity prices fall, suppliers (Caterpillar's customers) tend to restrain capital spending on equipment. The bad news is there's already some evidence that this is happening. We expect our global high horsepower engine shipments to increase 20%, down from our previous forecast of 35% growth with oil and gas shipments up 66% and mining shipments up 30%. These compare to our prior guidance of oil and gas up 100% and mining up 40%, respectively. Cummins COO Richard Freeland later talked of a "pause" in spending in mining and oil & gas, which he suggested was a consequence of "a little more cautiousness out there right now." It's clear that Caterpillar's prospects in 2019 are likely to be determined by trends in commodity prices. The construction market looks solid -- Deere's outlook confirms that -- but Cummins management's commentary suggests some softening in mining and oil & gas spending. All told, Caterpillar stock is attractive for those who believe a working resolution to the China/U.S. trade conflict will be found, and/or that China's economic growth will get back on track in 2019. If one or both of those are the case, then the current decline is a good buying opportunity. However, don't buy the stock if you are worried about a prolonged trade conflict and/or a downtrend in energy and mining commodity prices.